From Arequipa we boarded yet another bus, headed for the small town of Chivay. Along the way we stopped at several look out points, first to see a large herd of wild Alpacas and then one which offered scenic views across the rocky plains to smoking volcanoes in the distance. The landscape was dotted with the traditional Apacheta rock piles, built by locals in tribute to Pachu Mama. The drive from Arequipa to Chivay takes between 3.5-4.5hrs depending on stops and traffic – the major current delays being due to extensive road works. 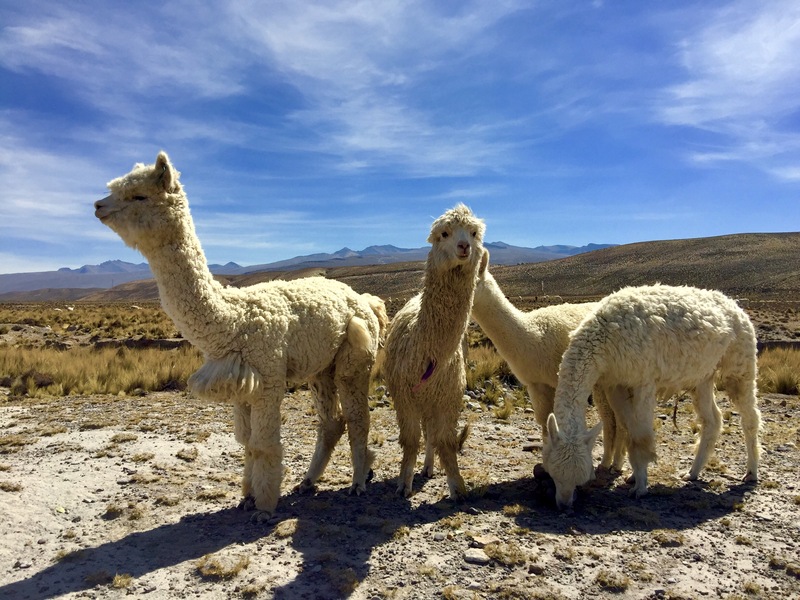 At the mid-point we stopped for a toilet break at a local market/ restaurant where we got up close and personal with some friendly Alpacas and one skittish Vacunea. Despite their hissing and threats of spitting the Alpacas were comfortable coming right up to you and were well versed in knocking over the sugar pots on the restaurant table. Chivay town itself was far from impressive, a small central square and church that was being dug up to lay new pavements. The restaurants and coffee bars in town were small, and largely overpriced. Jamie and some of the group went on a walk with the guide around town. There isn’t much to see in Chivay but they did walk up to a viewing point where the surrounding mountains and volcanoes came into view. There were also small stone domes with tiny entrances on top of the hill where the Incas used to hid from the Spanish. If the Spanish tried to enter they would hit them over the head with a large rock. The guide also explained how the two main groups of people who lived here, before the Inca, used to tell each other apart. One strapped wood to the top of their babies heads and to the chin in order the shorten the head. The other group strapped wood vertically to lengthen the heads. This continued for hundreds of years until the arrival of Spanish who convinced them to wear different types of hats instead of this barbaric practice. In the evening I was still not feeling well so Jamie went out for a small bite to eat with the group and then headed to do some star gazing. The area has extremely little light pollution so the Milky Way could be seen very clearly. For 25 Solis (£6) Jamie had a short planetarium show about the constellations, which the astronomer then pointed out with a lazy pointer outside. Particularly the southern cross, Scorpio and Taurus. Then he got to use their telescopes to see Jupiter and its four Galleon moons (Europa, Io, Callisto, Ganymede); Saturn and its main moon Titan; the nearest star to our solar system Alpha Centuri and its sister Beta Centuri which shone blue (showing it was a young star); plus various open star clusters (butterfly and jewellery box); and another bright blue star Vega. After an ice cold night at the hotel, we were up early to try and spot the Condors at Colca Canyon. Another hour long winding bus ride, through scenic passes and ancient terraces and we arrived at the Canyon. We certainly weren’t the first ones there – dozens of tourist buses were parked up along the path which lined the Canyon and which was dotted with packed viewing platforms. The Condors actually live and nest in the cracks and crevices on the rock face beneath where you stand – so it’s often difficult to see them. Not today however – after a quiet first ten minutes we walked down to a lower platform and were greeted with a series of spectacular flybys from dozens of Condors, both in pairs and groups – riding the thermals from the valleys. Even our guides were amazed at just how many Condors took flight – although taking a decent photograph proved more complicated than spotting them. 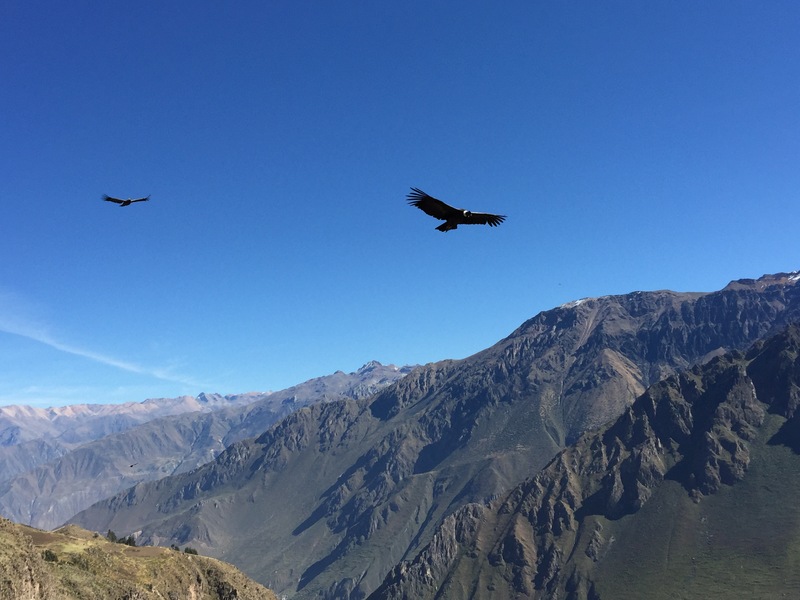 After the crowds of ‘ooohing and aaaahing’ Americans departed we took a short hike along the cliff face and saw more and more Condors, swooping above our heads and darting down the valley – presumably to feed. The hike also gave us a chance to appreciated the beauty of the valley itself, to admire some of the dozens of different types of cacti and to be terrified by some of the monstrously large, suckle nosed bees that swarm around us. Whilst these bizarre bees don’t bite or sting, it was a good reason to get back on the bus. After a short trip we stopped to take photos of the spectacular terraces that lined the valleys. 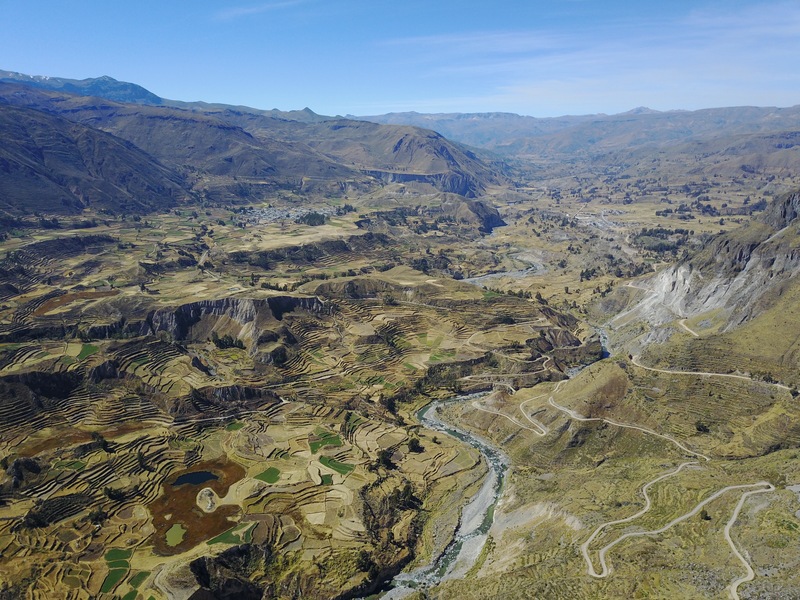 The terraces, used for agriculture were all pre-Inca, an amazing feat of engineering given the extent of the earthworks. Once back in Chivay, we stopped for a simple lunch before changing into our costumes for a visit to the local hot springs. 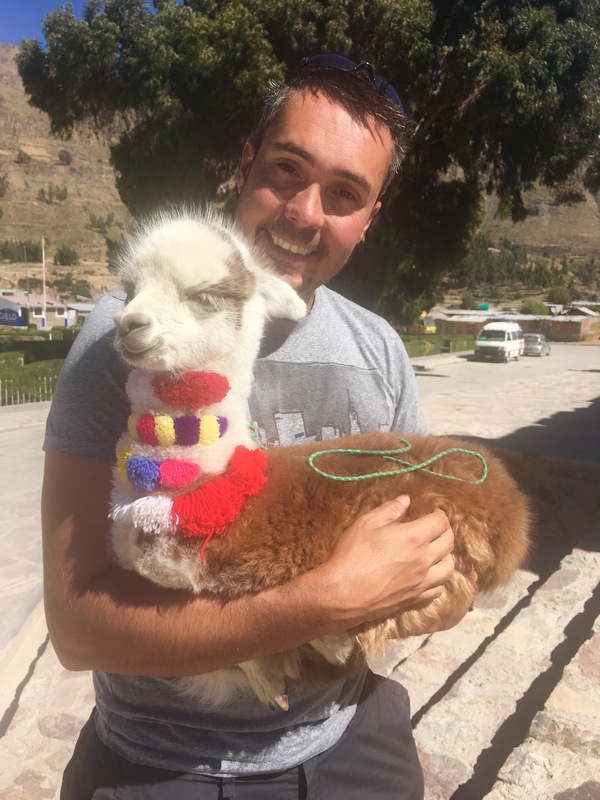 At the mid point ride, we stopped in a small town for water and toilet – only to be greeted by local ladies wanting us to hold baby llamas for money…who can resist a baby Llama! We’d been given the option between going to the ‘big’ touristy springs, or the smaller, quieter springs….we opted for the quieter, although I’d hate to see what the busy ones were like, ours being jam packed with oldies and other G groups. 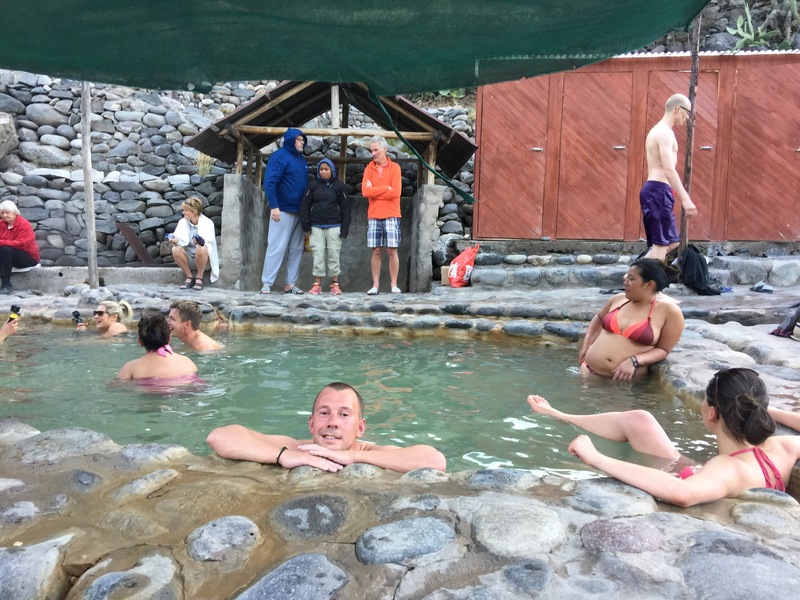 We couldn’t work out whether the hot springs were natural or not, whilst a volcanic area, the pools were distinctly man made and rather slimey. Regardless we enjoyed an hour long fester in the hot waters – our first ‘bath’ in 6 months and our first warm water swim since Fiji two months earlier. Dinner that night had been billed as a surprise – the surprise wasn’t all that surprising, a local dance Pena Show. Having seen the good, the bad and the ugly of local dance shows – this fitted in to the ‘bad’ category, despite the enthusiastic twirling of the participants. Too much excitement for one night – off to bed ahead of a very long travel day to come.